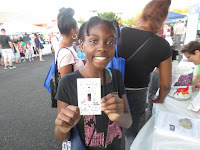 Saving energy can be fun! It's easy. The volunteers of the EAC are here to help you, your family, neighbors and friends go green. We work with residents, local organizations, businesses and the township to provide a clean and healthy environment for our community. 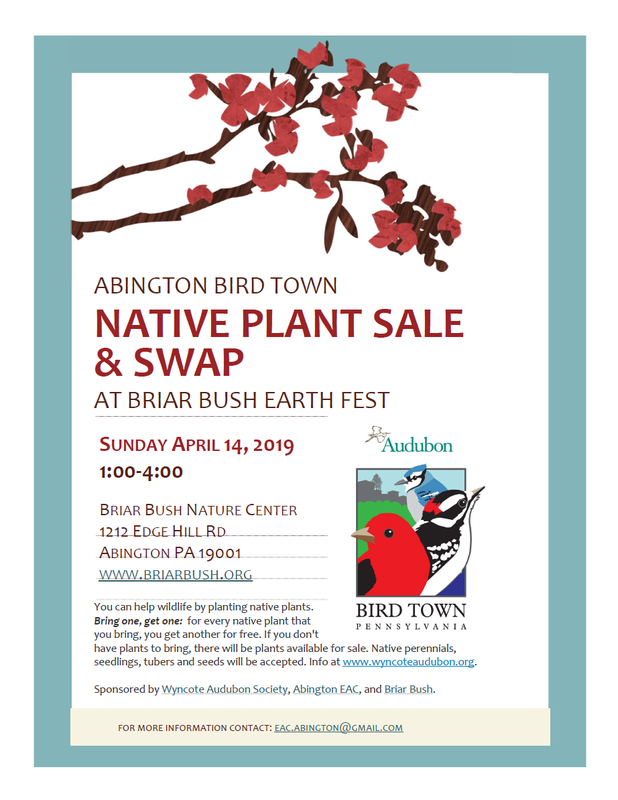 Why attend a native plant sale & swap? We need your help to clean up and beautify Abington's Parks. Cleanups are a great way to bring your community together and make a difference in your neighborhood. We count how much we plant and how much litter we pick up, and we report our results to the Great American Cleanup of PA*. In Pennsylvania last year, about 128,000 volunteers picked up over 6 million pounds of trash, and planted over 13,000 trees, plants and flowers. What a difference! The EAC provides snacks, trash bags, gloves, safety vests and tools. Please wear long pants and sleeves, and sturdy shoes. If you can help, please contact the EAC at eac.abington@gmail.com. For cleanup event organizers, please visit "Information For Cleanup Organizers". For details on upcoming events, click here. or here for Facebook. Please click here for the Montgomery County Household Hazardous Waste Collection Complete Schedule. For additional information please visit Montgomery CountyRecycles.org or call the recycling line at 610-278-3618. Free residential collection events are held outdoors from 9am- 3pm, rain or shine 6 times a year during the months of April through October. Montgomery County Residents may also attend any Household Hazardous Waste event held by Bucks, Chester, Delaware, Montgomery or Philadelphia Counties. Click HERE for a list of accepted items. Recycle your old electronics - "Anything with a plug"
Abington Township is proud to offer their residents the opportunity to responsibly recycle obsolete electronics. This FREE service is available to residents of Abington Township. ALL DATA MEDIA WILL BE DESTROYED OR WIPED! Laptops Dehumidifiers, Peripherals, Computers, Typewriters, Mice, Telephones, Small Appliances, Microwaves, Fax Machines, Cameras, Keyboards, Cell Phones, Printers, Calculators, Air Conditioners, etc. to donate to the Abington Food Cupboard, and earn a Go Green Rewards Card credit. 2201 Florey Lane, Abington PA 19001 (on left), (except the one at AJHS). Contact us if your group would like to schedule a workshop. For more info, visit our rain barrel page, HERE. The Spotted Lanternfly is a significant threat to Pennsylvania’s trees and $18 billion agricultural industry. These invasive insects have the potential to damage and destroy many species of trees, especially fruit trees, grapes and hops (effects wine and beer production). The Pennsylvania Department of Agriculture and the Penn State Agricultural Extension need your help to combat this invasive insect—already found in Montgomery County and in Abington. 13 counties in Southeastern PA are quarantined for the Spotted Lanternfly, including Montgomery and Philadelphia. Please help spread the word about this pest and the quarantine actions. Did you know that Abington Township is an Audubon Bird Town? Bird Town is a working partnership of Audubon and municipalities in Pennsylvania to promote conservation and community-based actions to create a healthy, more sustainable environment for birds and people. Audubon provides the tools for the municipality to engage their residents, schools and businesses in making more ecologically-friendly decisions, conserving energy, and in the process, saving money. A Bird Town makes efforts to restore valuable ecosystem services to create a culture of conservation where everyone is a potential steward of nature in their backyard and beyond. For more about conservation efforts, visit http://pa.audubon.org/conservation. To learn about making your home more bird-friendly, visit http://pa.audubon.org/audubon-home. All are Invited: The walk is open to anyone interested in learning more about the birds that frequent this Montgomery County Park that is part of an Audubon Important Bird Area. This walk is for beginning birders and experienced birders as well. Wear comfortable footwear and clothing. Bring binoculars if you have them. Pre-registration optional: Lorimer Park Office 215-947-3477. Directions: The Moredon Road parking area is the main parking area for Lorimer Park and is at 183 Moredon Road between Old Ford Road and Pine Road, entrance is on south side of road. The Welsh Road parking area is at the intersection of Welsh Road and Terwood Road, on the southwest corner, look for the Pennypack Trail sign. The STAR CommunitiesTM leadership program enables us to track our performance and compare to, and learn from, other communities committed to livability and economic viability. As the first national rating system of its kind, the STAR Communities Rating SystemTM has seven areas to measure progress over the long term. Volunteers are needed to help gather information and develop future plans with our affiliate Penn State Abington. For more information or to volunteer, email AbingtonSTAR@gmail.com. For STAR CommunitiesTM info, visit StarCommunities.org . You may be able to save money on your energy bills by switching from PECO to another energy supplier (electricity and natural gas). How do you choose which company to buy from? You can decide based on price, clean energy options, or local sources. For information on switching, visit the PA Public Utility Commission. To get details on clean energy suppliers, visit www.MakeBenProud.com. Learn how...by visiting our "Save Energy" page. Help us green your neighborhood! Surveying local streams and wildlife; becoming a "Streamkeeper"
For more information, email eac.abington@gmail.com. Thank you for volunteering with us at our Earth Day clean-ups in 2018. Together, we cleaned-up and beautified many parks and green spaces throughout Abington township. and flowers. What a difference! For event details, click on this Earth Day link. Thanks to Abington School District students, Boy Scouts, Girl Scouts, New Horizons, the Parkinsons, Wyncote Audubon Society, Zeta Phi Beta, and others for cleaning-up! Send us suggestions for locations for next year! Schools, Abington Friends School, Briar Bush Nature Center, Boy Scouts, Cheltenham Township and EAC, Girl Scouts, Friends of Hallowell Park, Keep Pennsylvania Beautiful, Meadowbrook Bird Sanctuary, the Ocean Conservancy's International Coastal Cleanup, PennDOT, Pennsylvania Horticultural Society, Pennypack Watershed and PERT, Redeemer Valley Community Garden, Rydal-Meadowbrook Civic Association, St, Basil's Academy, AT Shade Tree Commission, the Tookany/Tacony-Frankford Watershed Partnership, TreeVitalize, Wissahickon Valley Watershed Association, Wyncote Audubon Society, and the Youth Aid Panel. Wow! Join us! *By clicking on this link, you will leave the Abington EAC website and go to a website that is not maintained or endorsed by the EAC.